LOUDON, N.H. – With seven events scheduled over the course of the five days during NASCAR race weekend at New Hampshire Motor Speedway, Speedway Children’s Charities New Hampshire Chapter will be fundraising to help children in need across New England. Experience what it’s like to drive “The Magic Mile.” This is one of the very few opportunities that fans have to drive on the track. For a $30 donation, fans can drive their own car, or, for $30 per person, they can sit shotgun in the official New Hampshire Motor Speedway Toyota Camry Pace Car for three “fast laps” around the speedway just days before the NASCAR race. *Weather permitting and some restrictions apply. Spend the day on the golf course with NASCAR personalities at Canterbury Woods Country Club just minutes from the speedway! Register online for $150 per person or $600 per foursome. 2017 Monster Energy NASCAR Cup Series champion Martin Truex Jr. and 2017 NASCAR Xfinity Series champion William Byron headline this annual breakfast that benefits the Children’s Hospital at Dartmouth-Hitchcock and SCCNH. Tickets are $40 and can be purchased online or at the entrance of Hospitality Village. Get the chance to bid on Monster Energy NASCAR Cup Series sheet metal, racing gear and once-in-a-lifetime experiences. The auction will be held at the Trackside Live Stage, located next to the entrance of the infield tunnel with special guest Ricky Craven. Admission is free. Get an aerial view of the speedway on this scenic helicopter ride. Tickets are $60 per person and can be purchased at the helipad located outside of Turn 3. *Must be 18 years or older. Weather permitting and restrictions apply. NASCAR driver Ryan Blaney will lead the way for a walk around the 1.058-mile oval after the checkered flag falls for the NASCAR Xfinity Series race. Register online through 5:00 p.m. on Thursday, July 19 for $20 per person. 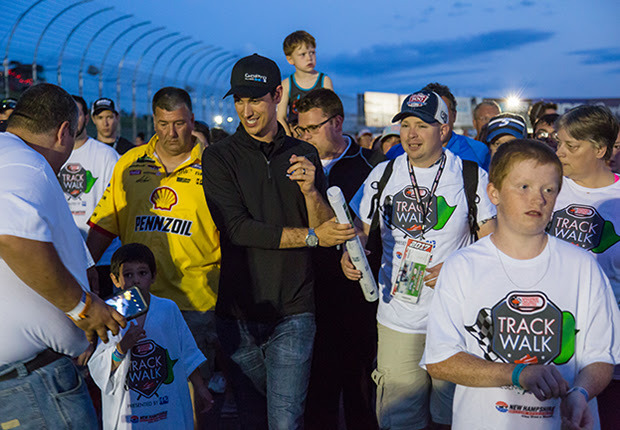 Onsite registration is Friday, July 20 and Saturday, July 21 from 9:00 a.m. – 5:00 p.m. in the NHMS FanZone for $25 per person. Children 16 and under are free with a paid adult. Have any spare change? Volunteers will walk through the stands with the red buckets looking for donations to help children in need across New England. Each December, Speedway Children’s Charities New Hampshire Chapter distributes grants to nonprofit organizations in the region. Since its inception in 2009, the Granite State chapter has raised more than $1.7 million, which has benefitted more than 667,000 children across New England. For more information about other upcoming events for Speedway Children’s Charities New Hampshire Chapter, call Hillarie Scott at (603) 513-5738 or visit SpeedwayCharities.org/NewHampshire/.